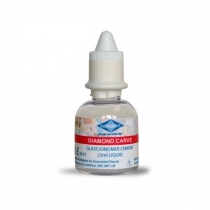 Diamond Carve provides dentists with a clinically proven restorative material that effectively performs highly aesthetic restorative procedures, replacing traditional composite, glass ionomer and amalgam methods of working. Chemical curing, without dimensional change, means Diamond restorations can be placed in one increment, saving time and avoiding the creation of stresses within the restoration that can be caused by incremental build-up using composites. Both of these advantages also contribute to its relative lack of post-operative sensitivity compared with bonded composites. Fluoride release is another significant advantage. Working time from start of mix: at 22-24°C 2 minutes 15seconds. Using a plastic spatula, mix half of the powder with the liquid to form a smooth, creamy paste. Then, mix in the remaining powder to form a firm, putty-like consistency. Do not make it dry or crumbly. In the case of multiple scoops of powder, incorporate each, in turn, into the liquid, making sure the final cement has a smooth and firm consistency.It should take approximately 30-40 seconds to mix them together. 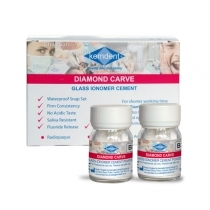 Due to Diamond Carve’s snap-set and to achieve good adhesion to the enamel and dentine, always mix fresh material for each cavity. Using a plastic spatula, mix half of the powder with the liquid to form a smooth, creamy paste. Then, mix in the remaining powder to form a firm, putty-like consistency. Do not make it dry or crumbly. In the case of multiple scoops of powder, incorporate each, in turn, into the liquid, making sure the final cement has a smooth and firm consistency.